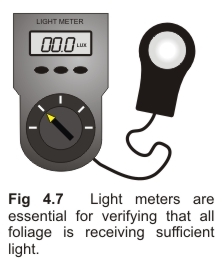 This is useful for determining whether light levels are adequate throughout the garden, as well as for routinely checking if lights are operating to specification (Fig 4.7). Ensure the ballast and lamp are matched. For example, lamps of different type (e.g. MH or HPS) or different size (wattages), may require a specific ballast. If using an ‘electronic’ ballast ensure the lamp is compatible otherwise premature lamp failure or blackening can occur. Lamps can explode if they are lit when cold, or have fingerprints on the glass. Always wrap the lamp in clean paper or a towel before handling. To clean the lamp glass use window cleaner or rubbing alcohol, and allow to dry thoroughly before use. Lamps should not be restarted immediately after being switched off. 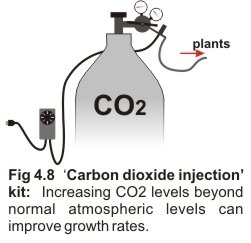 Before restarting, MH lamps should generally be left off for at least 20 minutes; HPS for at least 3 minutes. The intensity of a lamp will diminish with use, and may also use more power. Note that MH lamps have a shorter effective working life than HPS. The capacitor in a magnetic ballast will also deteriorate with use and consequently the light intensity will diminish. Ask the manufacturer for the useful working life of these items. Lamp directions will specify whether a lamp can be orientated vertically or horizontally. Failure to comply can cause poor lumen or color output, and shorten the life span of the lamp. Note, HID lamps draw large amounts of electricity therefore safety must be a priority.